Gun shops work in a hyper-competitive online market, and they need Search Engine Optimization (SEO) to stay successful. …to just name a few of services we have provided our e-commerce gun vendors over the course of 15 years. 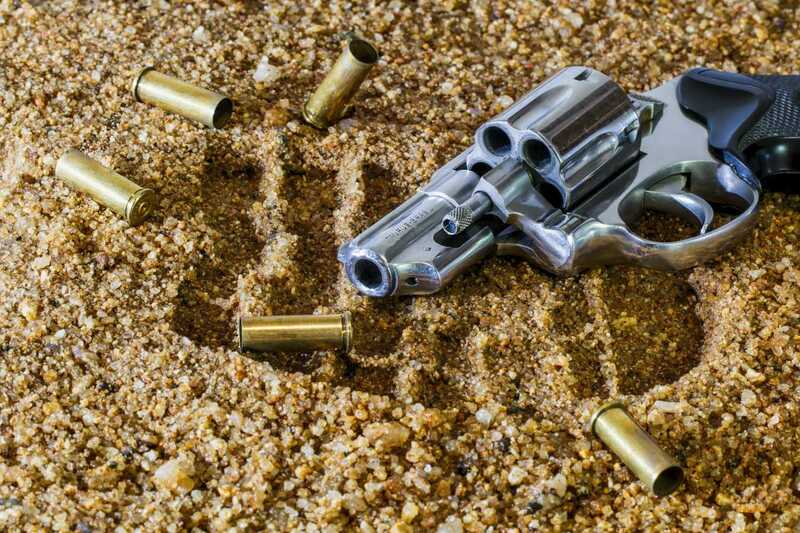 Why Does My Firearm Business Need Search Engine Optimization? When today’s consumer wants to purchase a firearm, whether online or in-store, the first place they go is online. Whether they are just doing research on different options or ready to make a purchase, search engines like Google tend to be where people go to do their research. They could be searching for “Places to buy a handgun in (your city)” or “buy sig sauer p290rs online” or even a question like “what is better for home defense handgun vs. shotgun”. Search Engine Optimization, or SEO, identifies what search terms your audience is using when conducting research that’s relevant to your business. Then, through a number of on-site and off-site changes, we optimize your website in order to improve your position for those search terms. The more people find out about your business through their own independent online research, the more likely they are to become a paying customer. …and so on. Expert marketers can help you install data gathering tools that can help you gain insight into your business and make numbers-driven decisions more accurately and effectively. …and so on. The more organized your overall website is, the better off you will be because people will know how to navigate through your pages to find the guns and ammo they need. Online consumers are many things, but you would be hard pressed to find any research that calls them patient. You need to make sure your website loads as quickly as possible, otherwise, you are likely to lose out on potential sales and your traffic will plummet as browsers become distracted. The more this happens, the more likely you are to drop in rankings. This becomes a vicious SEO cycle that can be challenging to reverse, but possible if you take the appropriate steps and understand the causes of the problem. 4. How Can I Make My Gun Shop’s Website Load Faster? Site speed is the result of numerous factors and variables coming together. However, one highly technical solution should be explored. Software developers working on a team with marketing experts can identify unnecessarily complicated code, and accomplish the same front end result with a simpler code that loads much faster. What’s more, if you have elements that are useless from a creative or technical standpoint on your website, we can identify these and remove them. This can improve your website speed as well. Many gun websites have incredibly large inventories or vast amounts of information that need to be organized. 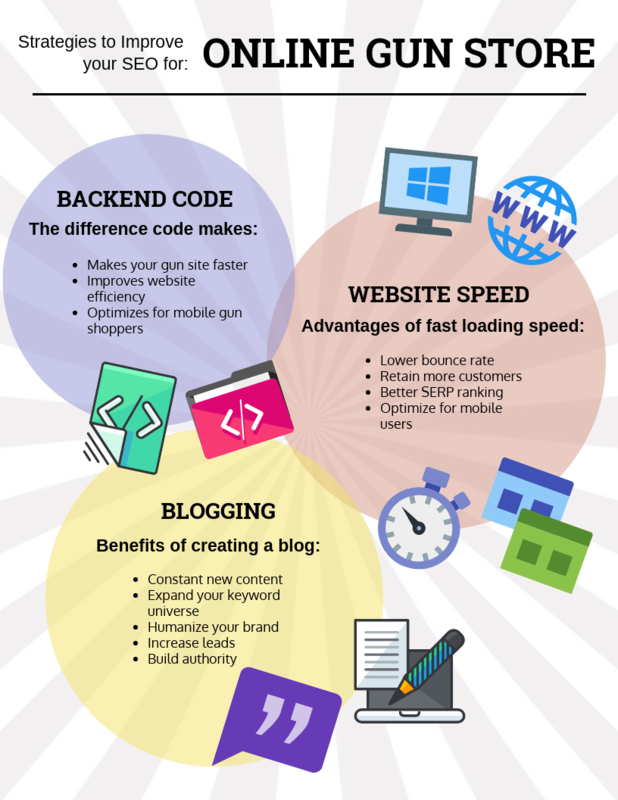 The more efficiently this is coded, the better your website will be. 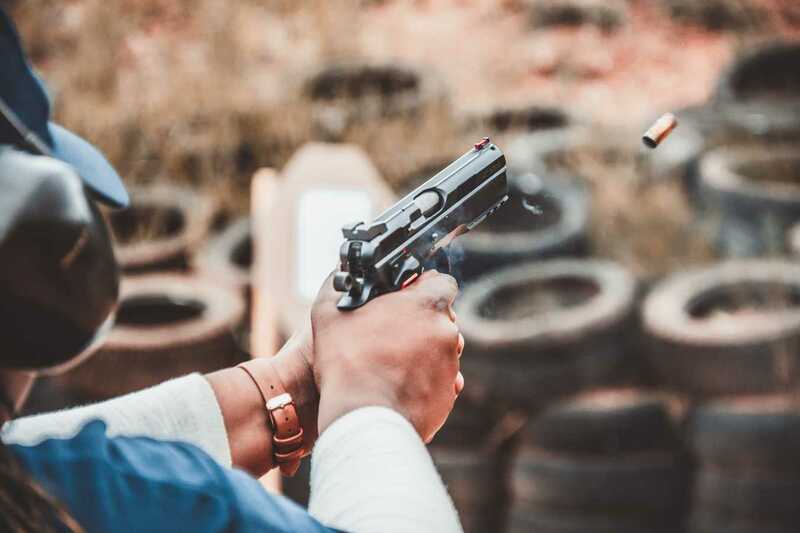 Blogs are an excellent marketing strategy for gun shops because they give you an opportunity to demonstrate your authority on your subject matter, which is a critical component of SEO. Search engines like Google tend to appreciate when a website is consistently updating, and a blog gives you the ideal format to do so. 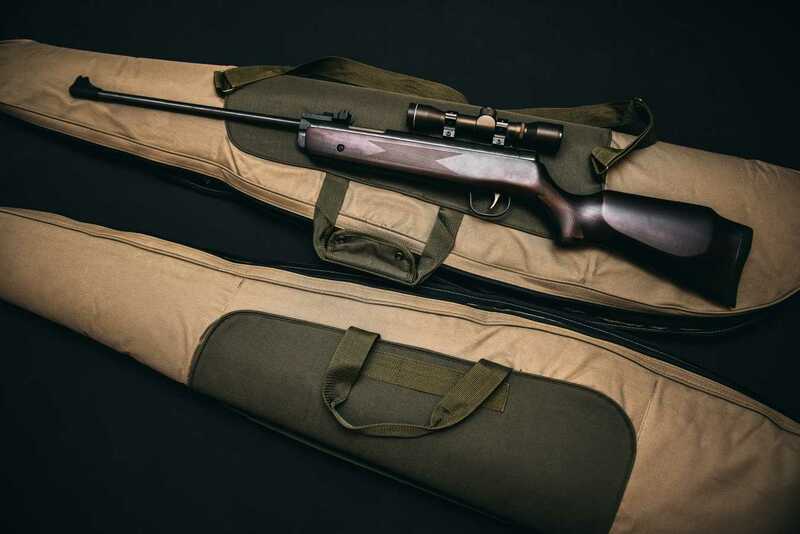 Your blog is perfect for featuring new firearms, seasonal gear, or highlight the services you offer. What’s more, it is the perfect place to publish guides or explain your gun shop’s experience with different firearm laws, and trends. It’s the forum where you review gear, talk shop, and hopefully, get links back once you become recognized as an online resource for information about firearms. All search engine algorithms want to deliver the best info as clearly as possible! Something your target audience can read, understand, learn from, and act on. Don’t get so bogged down in the latest guru’s advice about links or keywords that you forget to do the one thing that matters most: offer valuable information to people who want to learn about guns. ..and other elements. Research indicates that mobile optimization is a critical component of how Google assigns rankings to different web pages. 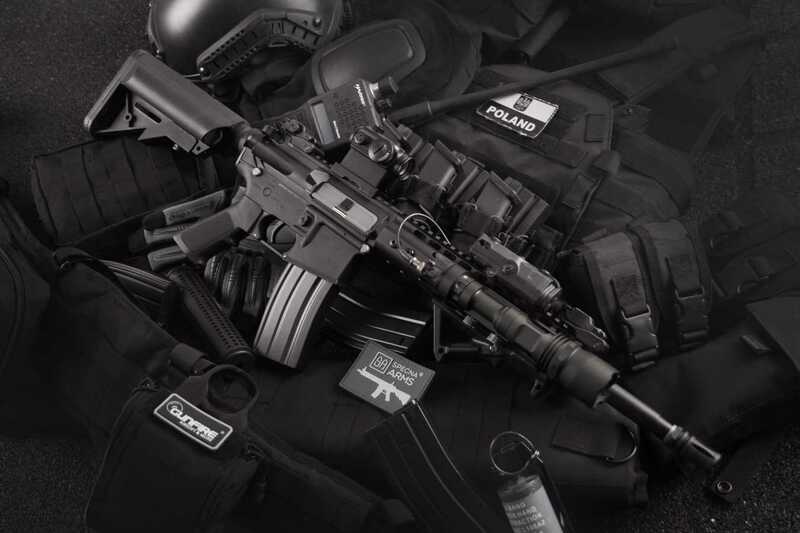 Leave the technical part of your online gun store’s success to us. With Optimum7, you can expect to see better quality traffic, new leads, and a larger revenue stream.